+2 When Alice has to be hidden in the teapot because the Knave comes over to the Mad Hatter. Johnny Depp played that little part beautifully! I love his facial expressions during this scene – I also love when she rides out in the armor before the battle. 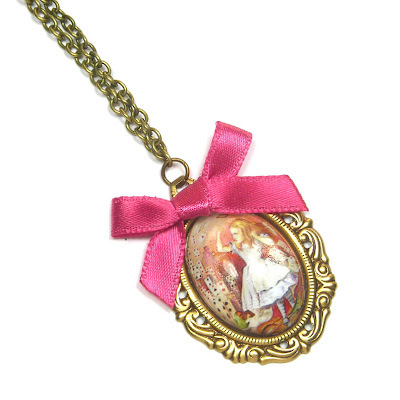 +3 visited Cherished Trinkets – I LOVE the pink rose ring & Alice charm bracelet! +3 I love the Magical Key vintage style necklace!! +3 My favorite is the We Are All Mad Here necklace. +3 follow ing both on facebook, look for clare tea. +2 My fav part of the AIW movie was the tea party scene in the beginning I think they potrayed the characters perfectly. thanks! Thanks for the giveaway! i love the movie! I really like the part when she drinks the bottle. Drink me.. jajaaj! oh yes! +2 Fave part of the movie was the tea party! +3 Fave thing was Magical key necklace! I loved the movie and the necklace! when she remembers that she is the ALICE.